Horseweed (Erigeron Canadensis) other names : Canadian Fleabane , Colt's-tail , Fleabane , Hogweed , Horseweed. 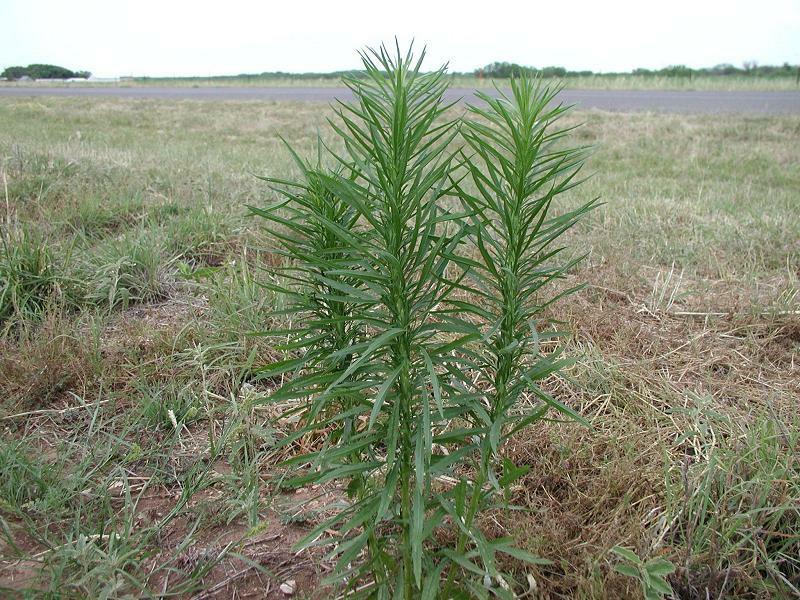 Horseweed is considered to be a weed that grows annually and has an upright stem that grows up to a height of seven feet. This stem emerges from a cluster of basal leaves, which wither afterward. The leaves of horseweed are lance-shaped having a deep green hue and appear alternately. Occasionally, the leaves of horseweed have jagged margins and spread out rough white hued bristles. Horseweed produces plentiful of small flower heads during the period between July and November in loose bunches. The flower heads possess minute yellowish central compact flowers as well as diminutive ray flowers having a lavender to greenish-white hue. These flowers of horseweed develop into white color tufted achenes or fruits having a solitary seed each. 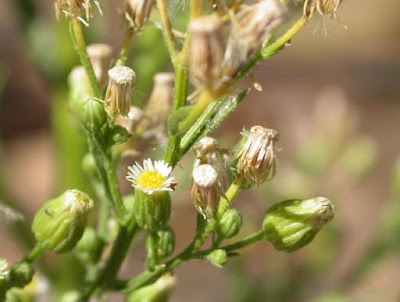 The genus name of horseweed ‘Erigeron' is derived from the Greek terms ‘eri' denoting ‘early' and ‘geron' meaning ‘old man', denoting the grayed and hairy fluff (pappus) that are appended to the seed tops. These become prominent once the flowers wither. There was a time when horseweed (also generally known as fleabane) was once a purely North American weed, the native Indian Americans introduced it as a medicinal herb to the early European settlers in the New World. Native Indians in America had a preference for an extract (decoction) obtained from the boiled horseweed leaves and employed it to cure dysentery. Afterward, horseweed was also employed in the form of a diuretic, a tonic/ stimulant as well as an astringent to treat hemorrhages. In contemporary times, several herbalists continue to recommend this herb for these purposes. Horseweed is most probably named so because of the plant's large size when compared to other related species. Moreover, Horseweed may also be named fleabane since horseweed produces oil similar to turpentine that keeps fleas away or owing the fact that the tiny seeds of the herb have resemblance to fleas. Horseweed is native to North America, but horseweed has now been naturalized in South America and Europe also. 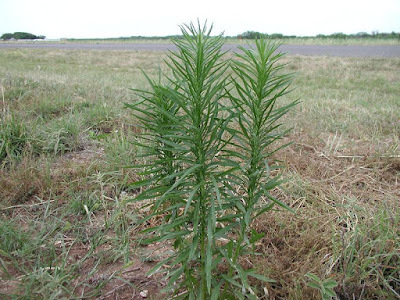 Horseweed succeeds on land that has been cleared lately or has never been cultivated. Horseweed usually invades in large swathes. Horseweed is actually collected from the wild, when the herb is in blossom. In effect, horseweed doesn't require much of the plant's environment. The horseweed of this species have a preference for gravel and sand, but the size of the plants differs according to the nutrition in the soil they grow in. In effect, the height of horseweed may vary from a few centimetres (dwarf size) when grown on poor soil to as high as seven feet when the soil is rich. A big horseweed plant has several capitula and produces plentiful seeds. Considering all things, all the species in this genus are remarkably adjustable and possess the aptitude to germinate during spring or any time in summer - in effect, this is vital to the success of this plant. As an annually growing plant that is unable to withstand competition from other plants, horseweed has a preference for open environs. However, they are also found growing in abundance in urban locales. Horseweed is an astringent herb which is employed to treat gastrointestinal disorders, for instance diarrhea and dysentery. A decoction prepared with horseweed is supposed to be highly useful in treating bleeding hemorrhoids. Sometimes horseweed is also employed in the form of a diuretic to cure bladder complaints, urino-genital ailments, the sexually transmitted disease (STD) gonorrhea and also to get rid of toxic substances when the patient is suffering from rheumatism. Traditionally, the essential oil extracted from the leaves of horseweed has been used in the form of a hemostatic (a medication that stops the flow of excessive blood). Pharmacologists are of the opinion that owing to its tannin content, horseweed may perhaps also be useful in stopping external bleeding. In addition, scientific researches have corroborated the use of the plant as an insecticide. Horseweed possesses astringent properties and also has stimulating actions on the mucous membrane as well as the muscles. Horseweed is an effective natural medication for stopping bleeding from any part of the body. Because the horseweed has an astringent action on the capillary vessels, it is of great use in treating conditions wherein there is excessive discharge of mucous of a chronic type dependent on atony (muscular weakness) as well as respite. In several instances, particularly in hemorrhages from the uterus, horseweed may be taken in combination with cinnamon for better results. To treat chronic dysentery, chronic diarrhea, flatulent colic and tympanitis (inflammation in the middle of the year), horseweed can be given in cases where there is atony and relaxation. In such cases, the treatment with horseweed ought to be preceded by employing a cathartic (purgative) to evacuate the bowels. 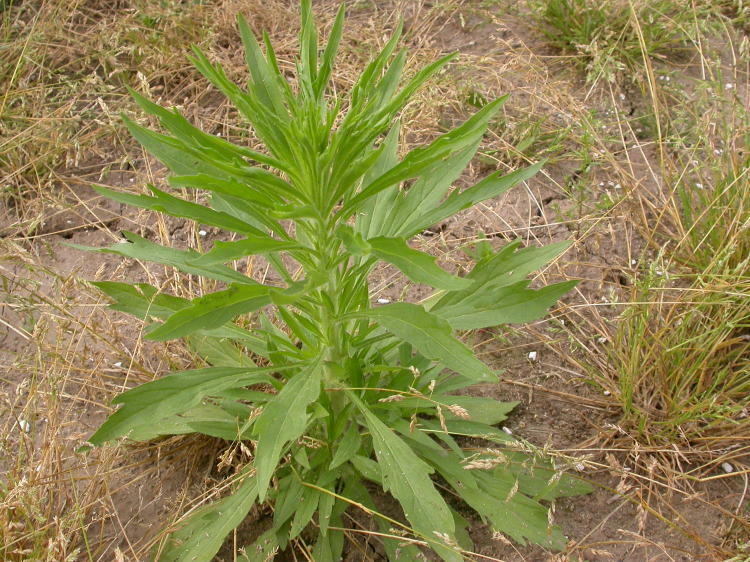 Horseweed is particularly helpful in every type of passive bleedings, especially when there is an absence of fever and distinct irritation. Native Indian tribes in America, counting the Mesquakies, made a powder of the horseweed blooms to prepare a snuff, which when inhaled, resulted in sneezing that helped in breaking up catarrh or a head cold. On the other hand, another indigenous tribe of North America, the Lakotas, prepared an herbal tea using the entire horseweed plant to treat children suffering from sore mouths as well as adults who faced problems in passing urine. The tea prepared from the whole horseweed plant is also employed to treat stomach problems, lameness and rheumatism. The flowers of horseweed are also blended with a buffalo's gall, brains and spleen and subsequently massaged on the skin to blanch it in the tanning procedure. The Navajo tribe in America employed horseweed in preparing lotions to treat body pains and headaches. On the other hand, the Cheyenne put the entire horseweed plant in boiling water and inhaled the vapour. In addition, horseweed was also boiled in water to produce steam for sweat lodge (a construction where people are made to perspire to cleanse and purify the body) and burnt to produce a smoke that kept insects away. Horseweed was also employed as a medication to flush out intestinal parasites. People using horseweed or herbal formulations prepared with it ought to be cautious, as the herb may result in dermatitis (inflammation of the skin) in sensitive individuals. It is advisable never to take horseweed if you are pregnant or a nursing mother.